A human rights activist has labeled the United States a "rogue state" because of its military campaign in Syria that has been approved neither by the United Nations, nor by the Syrian government. 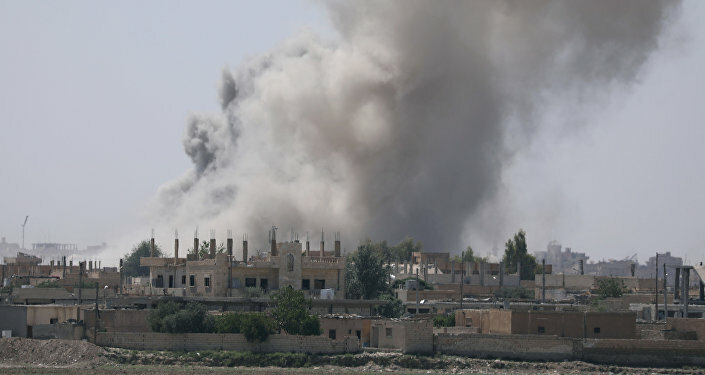 WASHINGTON (Sputnik) — The United States is behaving like a rogue state in Syria and is flouting international law, veteran human rights activist Ajamu Baraka told Sputnik. "Basically what we see is a rogue state, a state that is completely rejecting international norms, involved in war crimes and undermining international law. There is no legal right for the United States to be in Syria, but yet they are in Syria with no domestic opposition," Baraka, a former Green Party vice presidential candidate and the national organizer of the Black Alliance for Peace, said. The United States and a coalition of its allies have been conducting military operations in Syria since September 2014, claiming it is acting against Daesh terror group (banned in Russia). Moreover, Washington has repeatedly called for changing the government of Syrian President Bashar Assad. Baraka called on the United States to halt its support for terrorist forces in Syria and to allow the peace process in the country to go forward. "The first thing that has to happen is for the United States to stop supporting those elements that are committed to perpetuating the conflict, to stop supporting those elements that many people define as terrorist elements, and to be serious about a real diplomatic solution to this issue," he said. But Baraka said Americans will need to put pressure on their government in order for Washington to engage in serious efforts to achieve peace. "We say to the American people: we have to put pressure on the US government to be serious about peace in Syria and to abandon their fantasy of attempting to engage in regime change. The US has no right, no political or moral right to determine the leadership of any nation on this planet," he said. "We want to see a restoration of the commitment to the rule of law on the part of the US authorities." Baraka noted the Black Alliance was also concerned about the lack of American opposition to the ongoing bloodshed in Yemen, where he said the United States has aided and abetted a Saudi-led war. "We want to see an end to the humanitarian crisis created by the Saudis and supported by the United States," he said. "What we see are a series of crimes that has to stop, because we see that the people who are suffering are in fact the innocent people of Yemen." In March 2015, Saudi Arabia and a coalition of its Arab allies started military operations in Yemen in a bid to influence the outcome of a civil war. Saudi Arabia has sided with the exiled government of President Abd-Rabbu Mansour Hadi against the country's Iranian-backed Houthi rebels and forces loyal to former President Ali Abdullah Saleh. The United States has lent logistical support to Saudi forces during their military operations in Yemen and recently inked a $110 billion arms deal with Riyadh.